I apologize for any inconvenience to many fans who have been waiting and look forward to your kind understanding. This ticket is only for foreigners. You can get a ticket after being checked with your passport. Your booking will be canceled if you book a ticket with an illegal way such as using a macro program. If you lost or damaged your ticket, it is your fault. The ticket will not be reissued and you cannot enter the concert without a ticket. The concert will be broadcast live, so many cameras will be there. Because of cameras, your view could be blocked. The last admission time is 6 pm. After the time, you cannot be permitted to enter or your seat could be changed. After the concert starts, you could be not permitted to enter. For safety and security, any food and drink except water will be prohibited in the concert venue. If you disrupt others’ view with a tripod or a large camera, you could be restricted by the staff. If you book a ticket illegally or if you are a Korean, your booking will be automatically cancelled and you cannot get refund on your ticket fare. * Please present your exchange ticket voucher to receive the concert ticket at the ticket box on the day of concert. ※ 매크로 프로그램 사용 등 부정한 방법으로 입장권을 예매한 것으로 확인되는 경우, 예매는 강제 취소됩니다. ※ 티켓의 분실이나 손상으로 인한 책임은 본인에게 있으며, 어떠한 사유로도 티켓은 재발행되지 않으며 티켓없이 입장 불가합니다. ※ 본 공연은 생방송되며, 방송용 카메라로 인해 일부 좌석에 가림이 있을 수 있으니 양해바랍니다. ※ 입장 마감 시간은 18시이며, 이후 입장이 불가하거나 좌석이 변동 될 수 있습니다. ※ 공연 시작 후 입장에 제한될 수 있습니다. ※ 삼각대 및 대형카메라로 타인의 관람을 방해하는 경우 안전요원에 의해 제재 받을 수 있습니다. ※ 부정 예매나 해당 대상이 아닌 경우(내국인), 예매는 강제 취소되며, 환불 또한 불가능합니다. 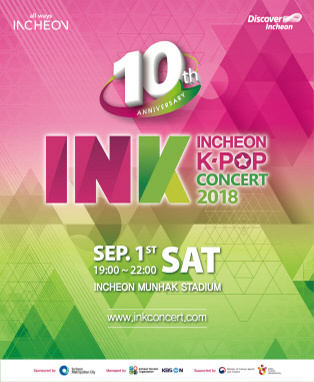 ※ 자세한 내용은 공식 홈페이지 (http://www.inkconcert.com)을 참고하시기 바랍니다.